Joyce Hamilton speaks out against U.S. Sen. Jeff Sessions, R-Ala., Thursday in front of the Federal Courthouse in Brownsville during an immigration protest as Hamilton speaks on Sessions response to immigration law and his use of the bible to defend his position. 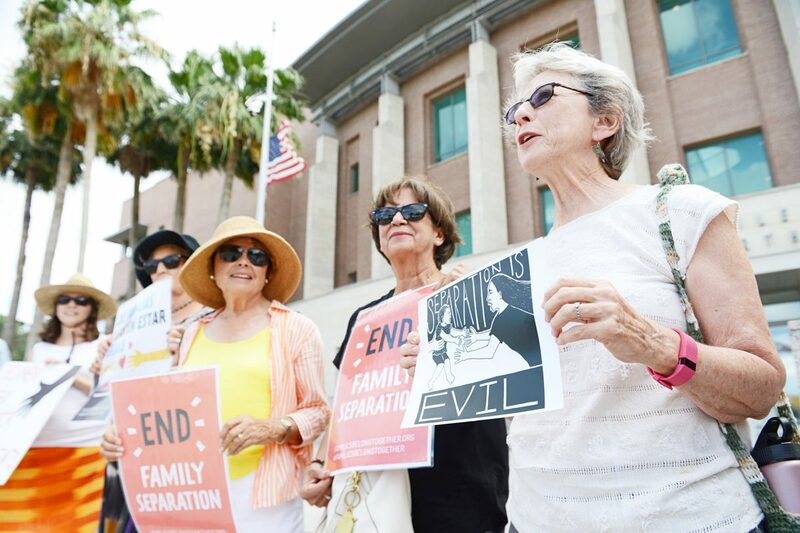 About a dozen protestors gathered Thursday afternoon on the steps of the federal courthouse to slam President Donald Trump’s policy of separating children from their parents as un-American. “Well, I think it’s just unconscionable that they are separating children from parents,” protestor Madeleine Sandefur said. The Rio Grande Valley has made national headlines in recent weeks as being ground zero for Trump’s controversial “zero-tolerance” policy in which children whose parents cross the border illegally, and in some cases that have been reported are seeking asylum, are separated from their parents and placed in detention facilities throughout the Valley. Two weeks ago, the debate gained heated momentum when a senator from Oregon attempted to visit the Southwest Key Programs-Casa Padre facility at the old Walmart building on Padre Island Highway in Brownsville, where staff called the police on him. On Wednesday, Southwest Key Programs allowed 10 national media outlets to tour the facility but did not invite local media. An inquiry into that decision sent to Southwest Key Programs on Thursday morning, along with a request to tour the facility with six senators who are scheduled to tour the facility Sunday, was not returned. That tour revealed that Southwest Key Programs-Casa Padre houses more than 1,400 immigrant boys, dozens of whom were forcibly separated from their parents under the “zero-tolerance” policy, the Washington Post reported.